I can't seem to get enough penguins and the ones from Sugar Pea Designs are just adorable. These are perfect for masculine cards and since I never have enough on hand, decided to start building my stash. 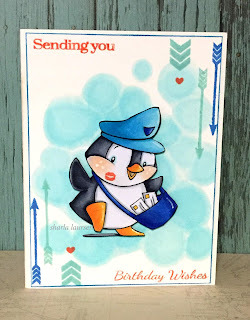 I used the Happy Mail stamp set and the sketch/color challenge at Sugar Pea for the jumping point of my card. Adorable! Thanks for sharing at Pause Dream Enjoy Challenges. What a great idea to use the arrows as a border! Thank you for sharing with us at LRW. Adorable card! Such a sweet image!! Great design too! Your little penguin is the cutest letter carrier EVER! Adorable, sweet, and just a delightful creation! So glad I got to see your critter project showcased at the 2 Crafty Critter Crazies Challenge. Thanks for joining us, and we hope to see more of your pretty creations in the future. Please check back to see if you are a winner. Sending you wishes for a wonderful day! oh this is so super cute - love the little penguin, too! Very nice and sweet creation! Thanks for playing along with this 2 Crafty Critters Crazies Challenge and good luck! Oh, this just makes me smile! Love your use of the sketch and photo as inspiration! 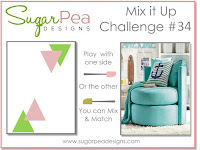 Thanks so much for joining us at SugarPea's Mix it Up Challenge! Adorable! Love the background. Thank you so much for sharing with us at the Colour Crazy Challenge blog. Good luck! Sharla, this is so adorable! !